Can you really sail with an iPad? Can it be used alone or does it need to be connected to the rest of the systems? What are the various configurations? Find answers below! The iPad alone can perfectly complement or even replace charting and navigation systems. In its "cellular" version, it includes the latest GPS chipsets with accurate positioning even in areas outside of telephone coverage. 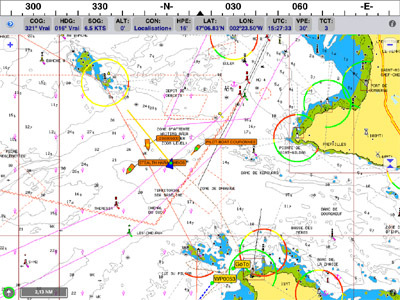 Nautical charts available on iPad - like Navionics - are identical to those used on plotters, and benefit from the tablet's outstanding display resolution for best details viewing. By using some of the great applications available on the Apple AppStore for a small fee - including iNavX or Navionics -you will be able to load nautical charts, plot routes, know the tide heights etc ... You can even view AIS traffic on the iPad. The iPad is also able to access marine weather files, either using cellular communications a few miles from the coast, or via a satellite phone for high seas (through a wifi access point). Indeed its communication capabilities are very useful for web browsing, mail, grib files etc.. and go much beyond what is available on plotters. But where the iPad clearly beats competition are the many quality boating applications, offering great ease of use, many functions that are close - or better - to ones existing on PCs, all this at a very low price. 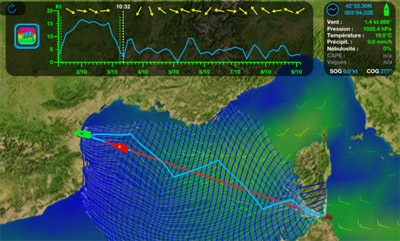 An application such as Weather4D Pro provides innovative viewing of weather, optimized routing, and will even tell you when to connect to satellites for weather downloads, for less than 30 € ..
Optimized routing with Weather4D Pro : blue boat arrives first while not going straight ! With the number of applications and accessories expanding every day, it is truly possible to navigate with a solution based entirely on the iPad. It will be significantly less expensive than traditional systems, with no complex installation on boat. 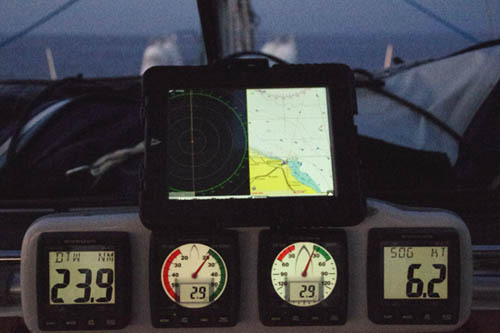 Since its debut in the "Solitaire du Figaro" race in 2010, the iPad has been adopted by many racers as a screen repeater, that is to say as a remote display used outside and showing information from a computer left inside the boat. This configuration is still widely used by racers but also by many navigators who already have a PC on board and are eager to benefit from an external display for more comfort and safety. We wrote a detailed tutorial on how to set-up the link between an iPad and a PC or Mac. More recently, marine electronics manufacturers have adapted their offer to allow the use of a tablet directly from a multifunction display (MFD) or through an integrated wifi module (Raymarine E series, Furuno TZ Touch) or with an adaptor (Simrad's GoFree). These solutions are interesting because they allow to view the entire contents of the MFDs on the tablet, including radar or sonar graph. But it is also a limitation due to the slow video link and specific ergonomics of these tracers which will not allow to use all possibilities of iPad. Also this link doesn't allow to view different content between the iPad and the tracer. Note also that this solution requires in general to change MFD, since only the newer models are compatible. Thanks to its Bluetooth and WiFi communication capabilities, the iPad can connect directly to on-board sensors and instruments. Simply install a NMEA-WiFi adapter box to convert NMEA data to WiFi and make it available on the iPad. Among these boxes, we can mention Shipmodul's Miniplex-3wi-N2K, which is the current market reference for its ease of installation and its ability to process NMEA information from multiple manufacturers and formats: NMEA0183, NMEA2000, SeaTalk, etc. Another interesting product is the XB8000, an AIS transponder that can also relay the boat's NMEA0183 and 2000 information through WiFi. Note that the iPad can not only display NMEA information, but also send feedback commands, such as autopilot support! Finally, the emergence of new wireless sensors (wind vanes, depthmeters) designed to work autonomously with a tablet even in the absence of a NMEA network also reinforces the tablet as the boat's central communication point. This opens up interesting new possibilities. For example, while a Bluetooth windmeter cannot be connected directly to a NMEA installation, the Weather 4D application is able to resend information in the right format back into an existing NMEA network, making it available for display on the on-board repeaters or the auto pilot! Whether you use the iPad just as an additional GPS on-board, or you want to make it the main navigation tool, mature solutions exist. Many sailors begin using the iPad as a remote screen for their PC in order to carry-on using their familiar navigation software. It generally doesn't take long until they try and compare with iPad's standalone applications and not use their PC anymore ! After this step, they often want to go a step further and receive instruments in wifi, especially for AIS watch ! What is certain, is that whatever the chosen configuration, the iPad will bring a significant plus compared to previous equipment due to its remarkable simplicity, reliability and ergonomics.